Moscow so far has refrained from assessing Trump’s latest remarks. "Let's be patient, let's wait for Mr. Trump to come into office as president and then assess his initiatives," said Dmitry Peskov, the Russian president’s press secretary. Photo: Topol-M ground missile complex launcher. The U.S. may reconsider sanctions against Russia if the latter agrees to reduce its nuclear arsenals, said U.S. President-elect Donald Trump in an interview with the British newspaper, The Times. According to military experts, if the reduction is reciprocal then such an agreement will be to Russia's advantage. Russia, however, will first want a change in NATO policy. U.S. President-elect Donald Trump wants to reach a deal with Vladimir Putin on a significant reduction of Russia's nuclear arsenals in exchange for a partial or full lifting of economic sanctions. "They have sanctions on Russia - let’s see if we can make some good deals with Russia," the Republican president-elect was quoted as saying by The Times. “For one thing, I think nuclear weapons should be way down and reduced very substantially, that’s part of it. But Russia’s hurting very badly right now because of sanctions, but I think something can happen that a lot of people are gonna benefit." Trump's remarks leave room for interpretation. If he is talking about a reciprocal reduction of nuclear arsenals, then this contradicts remarks he made at the end of 2016. A month ago Trump saw an urgent need for his country "to greatly strengthen and expand its nuclear capability." Moscow so far has refrained from assessing Trump’s latest remarks. "Let's be patient, let's wait for Mr. Trump to come into office as president and then assess his initiatives," said Dmitry Peskov, the Russian president’s press secretary. "This proposal is to Russia's advantage and, if it is officially offered then we should agree to it,’’ said Major General (Retired) Vladimir Dvorkin, a senior fellow at the Russian Academy of Sciences’ Institute of World Economy and International Relations. ``But Trump is unpredictable, and today he says one thing and tomorrow he says another," said General Dvorkin. ``We should wait for the new U.S. Secretary of State to make an official proposal to Putin, or at least a telephone call to Foreign Minister Sergei Lavrov." General Dvorkin added that there is nothing new in the call to reduce nuclear arsenals, and that Barack Obama since 2013 also has called for a reduction in the number of deployed nuclear warheads by a third. Under the 2010 Prague agreement, Russia and the U.S. set a ceiling of 1,550 deployed nuclear warheads on all types of delivery vehicles. "Since 2013 we have resisted a new reduction by every means possible, by putting forward totally unfounded arguments, and saying that a reduction in the arsenals would impact the Russian nuclear deterrence even when our specialists made arguments to the contrary," said General Dvorkin. "The Americans propose reducing the number of deployed nuclear warheads to 1,000 and the number of all types of delivery vehicles to 500, but it’s important to understand that nuclear weapons mean different things to Russia and the U.S.," said the TASS military expert, Colonel (Retired) Viktor Litovkin. For Moscow, it’s a deterrent, but for Washington it’s a burden on the battlefield whose servicing is very costly." In place of nuclear weapons, the Americans are developing and utilizing cruise missiles with conventional warheads that are almost as powerful as some nuclear warheads. 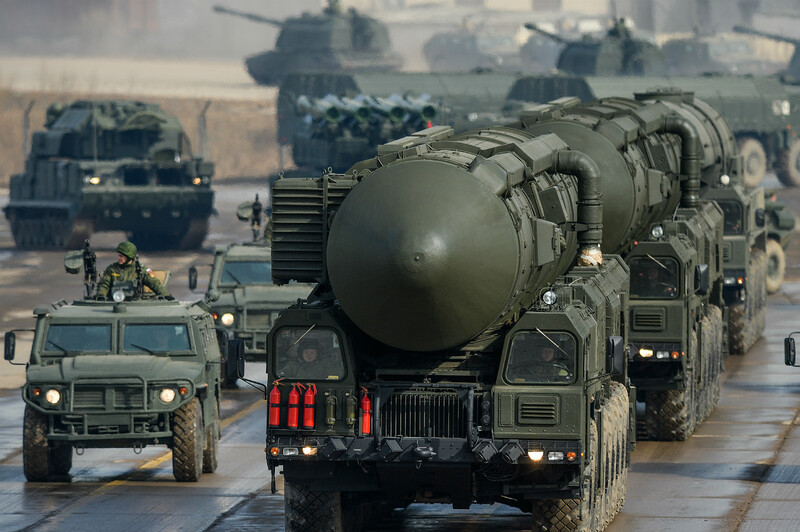 "In modern warfare one does not need a weapon with an explosive capacity of 300 kilotons and a missile that deviates from its target by tens of kilometers," said Colonel Litovkin. ``Unlike the systems of 50 years ago, today’s weapons are high precision, and it is sufficient to use a conventional warhead of 100 kilotons that leaves no radioactivity and has no psychological impact on global public opinion." For talks on nuclear disarmament to succeed with Russia, it’s necessary not just to abolish sanctions but also to improve the geopolitical situation in Europe and the world, said Colonel Litovkin. "It will be problematic to hold talks with Moscow on reducing the number of nuclear warheads when new NATO brigades are arriving in the Baltic states, and a missile defense system is being deployed in Poland and Romania that could easily be transformed from a defensive system into an offensive one," Colonel Litovkin concluded.